Pictured below is the A350 multi-stage electronic temperature control system thermostat manufactured by Johnson Controls. Factory installations of the A350 include chilled water and tower water systems. The A350 can also be field installed for single unit replacement of manual thermostats used on tower applications. It is approved for use on UL listed panels. 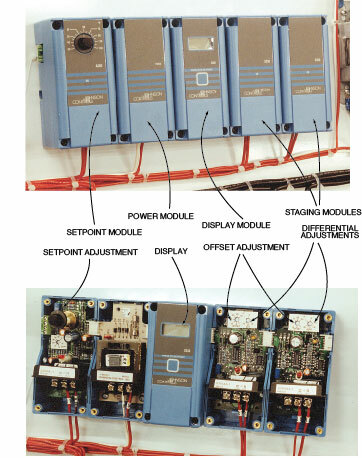 The A350 consists of an analog set point module, power module, digital display module, and up to 9 staging modules. There is a 2°F minimum differential between staging modules. The assembly is DIN rail mounted on the electrical panel. The assembly pictured on this page is from a PTS-800 system and operates the tower pump, tower fan and alarm. The staging modules activate at an adjustable offset from a common setpoint. The differential between "on" and "off" can also be adjusted on each module. For more information on multiple stage thermostat system for pump tank stations and pumping systems call the Advantage Sales Department at 317-887-0729. Would you like to Download FYI #222 to your browser?